SCD Group: Timing Associations and NCAA Basketball Games: How much learning time in your conference? Timing Associations and NCAA Basketball Games: How much learning time in your conference? The NCAA national basketball championship plays out tonight (4/8) with Michigan facing Louisville. 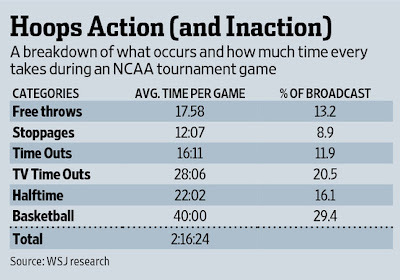 The Wall Street Journal timed NCAA tournament basketball games this year and discovered that playing basketball (40 minutes) represents only 29.4% of the game time. See chart below. Interesting – but perhaps not surprising – stats considering that TV timeouts are 20.5% of the game time. Most associations promote the learning value of their conferences and conventions. Does your overall schedule reflect learning time? If not, how are you allocating time at your events? You may want to check in ... perhaps even as thorough as WSJ did for basketball ... to see how you are doing. Remember, when you are timing these, don’t count introductions or “sponsorship acknowledgments” as part of learning time. If you think this is learning time, see how many attendees are not in the hall during the general session. Based on some research of attendees for some client conferences, attendees come to your meetings not for big name speakers, not for a “fancy” location but for the content and what they will learn. Forget this and your attendance trends may track downward. Have you timed your conference agendas? What are you finding? Is your association delivering learning of value to your members and attendees? Although you probably can't count it as "learning time," networking is also one of the reasons people attend conferences. How many times have we all heard that what happens in the hallways is as important to attendees as what goes on in sessions! Thanks Chris. Yes, I was looking only at "learning time" and purposely did not include "networking." Let's face it, some "hallway learning" comes because we've failed to offer learning of value in our sessions. In addition, our members can network with others via social media far easier than 10-15 years ago. So, we need to be careful about how much we rely on networking as a reason for members to attend our conferences.